We’re here to find the best work boots – and so much more. An informed work boots buyer can directly go to our top pick section here for men and here for women. If you are going to buy work boots for the first time, you may like to know the history of work boots. In rush? you should at least check our common features of a work boots section. You will feel more confident when you know about safety symbols. Work boots buyer from a particular profession may like to know about features depending on occupations. Finally, To make you informed buyer we have listed top brand of work boots at the end of this guide. A boot is generally tough and thick, with coverage that protects the entire foot and up to the ankle. In fact, there are boots that reach the lower calf and the knee area. You can wear this type of footwear for casual purposes. But, there are also boots created to suit the performance of the working individual. In this guide, we’ll take a comprehensive look at the work boot. Our team will help you learn why the boot is an essential part of working life. You will know about its history, features, and manufacturers. With that in mind, let’s start off by identifying the work boots that is the best for all-around use. If you are looking for reliable and sturdy work boots, you should take a look at our top recommendations. These are the best work boos for general use. They might not be at the top of the competition for specific use, but we guarantee they excel in all-around use. Here, we divide our picks into two: the best women’s work boots and the best men’s work boots. Moreover, each of these will have three products. The first one is our top pick, which means that it’s what we’d want you to have. If the work boots we chose are unavailable in your area, we have an alternative pick. The alternative choice is worth considering if you are not convinced with our first pick. Third, you can see our low-budget choice to get the best without breaking the bank. Electrical Hazard - meets ASTM F2413-11 Safety Standards,Outsole:Rubber-EVA Traction Tred. 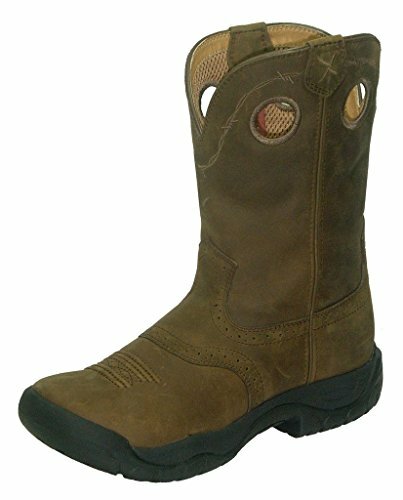 The first choice for men is the Irish Setter 83605 with their pleasing brown design. These boots are a stellar combination of classic appeal and modern sturdiness. Also, classic design even has the iconic lace-up system with the metal eyelets. These boots have a moc toe design. The design is a beloved style that American brands continue to use. Furthermore, the Irish Setter 83605 uses triple-stitching for a sleek look. The 5.5-inch shaft ensures ankle support. The brand also has the exclusive and handcrafted Trout Brook leather. These boots are comfortable due to the padded collar and the Traction Tred soles. The manufacturer made these soles for workers who were always standing. You should get these if you want to wear the lightweight work boots. The Irish Setter brand doesn’t even stop there as they went all out to guarantee long-term comfort. The polyurethane footbed provides ample air circulation. Moreover, the EVA midsole more comfort with its remarkable cushioning. These are the best because they can’t be beaten in a working environment. First of all, there’s the Goodyear welt construction that won’t let you down. Second, these work boots meet the soft toe standards set by the ASTM F2892-11. Next, workers who are at risk of electrical hazards will like the fact sole and the heel sections. The manufacturer designed them to prevent such risks. Also, the heat-resistant outsole can withstand at least 475 degrees Fahrenheit. The Irish Setter 83605 also meets the safety standards of the ASTM F2413-11. 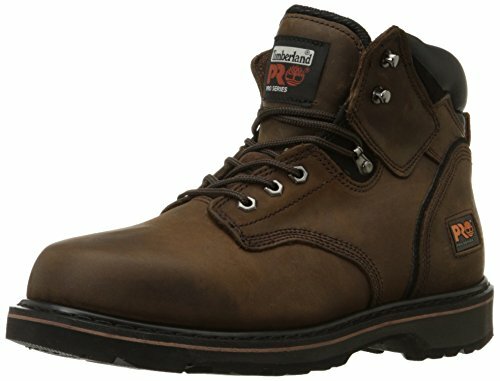 It might take several days before you break these in, but you won’t ever go wrong with the Irish Setter 83605 Work Boot. These are the work boots that are worth the price. If you’re looking for another designed pair that’s almost as impressive as our top pick, check this out. The Timberland PRO Pit Boss Soft Toe Boot has a soft and rounded toe box. Moreover, the toe box construction adheres to the ANSI safety standards. You won’t feel cramped at all with such a well-built toe box. The shaft measures six inches from the arch, making it half an inch longer than that of our first choice. Also, removable insole is both contoured and cushioned for a better fit and comfort. Likewise, the padded collar is decent. There’s also the full-grain leather. This had the speed-lacing hardware – a smart lacing system that provides the best fit in the fastest way possible. Now, as for workplace performance, there’s a lot to commend here too. The rubber outsoles of these Timberland work boots won’t make you slip regardless of the surface. The outsoles offer good traction. These also resist abrasion and protect the wearer from electrical hazards. Our third suggestion is an affordable pair of work boots. This does not sacrifice comfort or safety for its affordable price. The seven-inch shaft of these boots is the longest among our three picks for men. Also, the brand said that their product is a combination of durability and fashion – and we agree. These boots come in either tan or dark brown, and either of these color choices is aesthetically appealing. Like our top pick, the EVER BOOTS Tank Soft Toe Work Boots use the Goodyear welt construction. The removable and cushioned insole will keep you comfy. The rubber outsole has good traction and slip-resistant properties. These boots have speedy hooks and back loops, which allow you to tie the laces fast. Finally, you’ll also have a three-month manufacturer’s warranty. If the leather or the outsole gets ripped during that timeframe, you can use the warranty. This is also applicable if the upper of these work boots get separated from the rubber outsole. These work boots from Twisted X have surpassed our expectations. They combine premium comfort with durability. On appearance alone, these work boots exude the classic western style. You can see the brown color along with the distressed leather design. The shaft is nine inches in length from the arch, which guaranteed ample ankle support. You can use this work boots for women on concrete floors, muddy soil, and on wet grounds. Likewise, you will feel comfy and less fatigued thanks to the light build and the rubber sole. Furthermore, your feet won’t feel cramped and dirty with the memory foam insoles. This is because they have anti-bacterial and moisture-wicking properties. One woman was totally surprised at how cushioned and perfect they were for farm work and hunting – as if she was walking on clouds.- check it from Amazon. You could put the flexible insoles of the Twisted X work boots inside the washing machine. It also has a composite shank for increased stability. This makes it easier to climb ladders and slopes without feeling all the weight in each step. Moreover, the toe guard is sizable and durable enough despite its rubber material. The EVA midsole improves the stability and flexibility of these stylish work boots. Despite the affordability, these boots can compete with pricier models. In fact, the five-inch shaft is a full inch longer than the Wolverine boots. These work boots have full grain leather for durability. Likewise, a clever membrane construction provides waterproofing properties. The outsole of these affordable work boots is both oil-resistant and slip-resistant. You could go to auto shops and wet cemented ground without slipping. As for the insole, it’s removable and includes extra cushioning for comfort. Even as a budget pair of work boots, the Avenger 7124 manages to be tough. It has a steel toe cap that meets the standards set under ASTM F2413-11. This proves that it can protect your feet from workplace hazards. 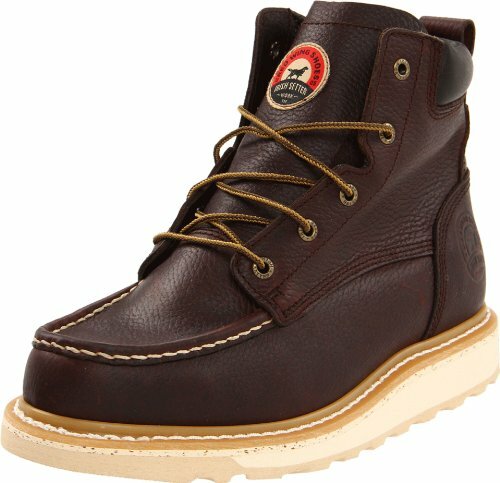 If you are still anxious about spending a lot on work boots, get these ones. The Avenger 7124 Leather Work Boot is exactly what you’re looking for. Its highest price is ridiculously lower compared to the maximum costs of our first two recommendations. If you do not like the western design of the Twisted X work boots, you can choose these ones. These are leather work boots with an EVA midsole, like the Twisted X WAB0001. A noticeable difference is the height of the shaft. Instead of nine inches, it’s four inches – a reduction that’s still good for protecting one’s ankles. Likewise, the shanks of these nylon Wolverine work boots are light yet tough. An inclusion we commend is the wave mesh lining around the boots. The lining decreases moisture levels and improves air circulation. The fit is nice due to how the tongue design. These light work boots are true to size, unlike other pairs that felt either too wide or too tight. We know that these can last you long as long as you treat them with care. 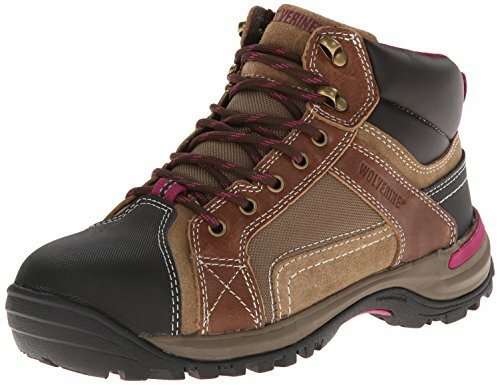 The Wolverine Chisel Hiker Safety Toe Hiker uses synthetic leather for the soles. Thus, they are resistant to water and abrasion. 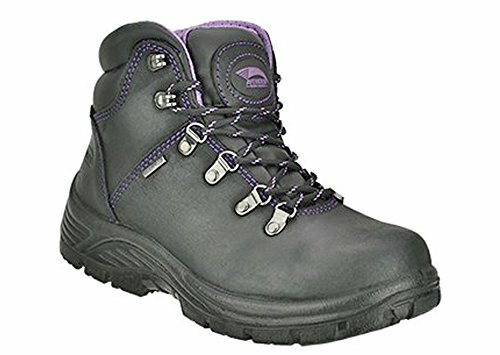 It wasn’t specified on the product page, but an observant mother, at Amazon, found out that these work boots were steel-toed, which offers the toughest toe protection. As a bonus, the thick and non-marking rubber lug outsoles of these work boots are good for traction. Thus, you wouldn’t have to worry about damaging tiles and wooden floors while wearing these boots. We’ve told you the best boots for men and women and gave our arguments why we picked them. It’s possible that you are reluctant to buy a pair of boots after receiving our recommendations. This is why we’d like you to know our intentions for doing this in the first place. The Sturdy Boot team is intent on providing the information you would ever need to pick the right pair of boots. Like you, we and our peers know the importance of productivity in the workplace. We take into account what matters the most to you: safety, design, cost, and performance. We do not give our readers an unchanging list of work boots. Instead, we check the products on a regular basis. Our team notes the latest in customer feedback. We make it our mission to know any changes in products and determine if we have to revise our lists. In turn, you will be well-informed thanks to our updated buyer lists. Moreover, we want to encourage workers to help each other out. Individuals can help their peers make the right choices. This is possible if we are all informed about buying work boots. Every one of us is a consumer, and we’re all better off if we share what we learn. In fact, we’re going to let you know more than our top picks. Our aim is to give you an encompassing guide to work boots — and that includes tracing its history. Start reading - Its tasty ! A work boot protects the wearer from harm, particularly those that arise due to one’s occupation. For example, a construction worker should wear steel-toed boots. Likewise, there are work boots that work best against water, chemicals, and the cold. This wasn’t the case when the work boot was in its infancy. So, how did the work boot come to be in the first place? We have to go back to the Industrial Revolution. This period took place from the late 18th century to early 19th century. Droves of people in Europe were moving from rural areas to work in cities and factories. Instead of steel-toed boots, they were using wooden boots referred to as sabots. People in farmers were already using these wooden boots. Farmers didn’t worry about getting hurt by sharp objects or farm animals. In the Netherlands, these sabots had a significant role. The workers actually used them for protests. The working class would throw the sabots into the gears. This would then halt production in factories. First, there were wooden boots and leather boots. After that, there was a big shift to steel-toed or safety boots. This occurred in the early 20th century. Industrialization was rampant. More and more people needed a trustworthy pair of boots to protect their feet at all times. Cases of work-related injuries were increasing. Also, the existing laws didn’t help keep the workers safe. The enactment of Compensation laws finally convinced companies to get good safety equipment. It was no longer a good financial decision to replace an injured worker. The compensation companies gave was far pricier than buying safety equipment. In line with this, boots became steel-toed. These worker safety boots prevented many punctures and other safety-related issues. Starting in the 1930s, Red Wing Shoes began manufacturing steel-toed work boots. On a related note, German marching boots were also reinforced with steel toe caps. These became the standard boots of non-commissioned officers during World War II. By 1970, the United States also improved worker safety. They enacted the Occupational Safety and Health Act. The United States Occupational Safety and Health Administration set the workplace standards. The use of appropriate work boots reduced work-related injuries. This was a good change in mining industries and construction sites. Of course, the steel-toed boots became used beyond the workplace. Punks and other subcultures used steel-toed boots and other work boots in the early 1960s. Fast-forward to today, and work boots have improved a lot. They now look better and are sturdier than ever before. Work boots now come in various styles and colors. There are now variants that use plastic or composite material. Still, many workers still have work boots with steel reinforcements. We’ve now gone through centuries to learn about work boots. Now, let us identify the features themselves that characterize the modern work boot. Work boots today differ a lot in style and appearance. Still, there are characteristics that you should still take note of. Here, we look into the types of safety toes and soles that differentiate work boots from one another. The need for work boots expanded across many industries. With this change, materials changed from steel to composite and alloy. Depending on your job in a given workplace, you might have to own more than one type of work boots. They all meet the standards of the American National Standards Institute (ANSI). Also, they adhere to the standards of the American Society for Testing and Materials (ASTM). You cannot go wrong with the best steel-toe work boots if you value impact resistance. It’s rare to end up in a situation where you push the limits of steel toe caps. Still, they are a standard choice for the harshest work environments. It also helps that steel toe caps are more affordable than composite toe caps. This type is as tough as steel because it uses aluminium and titanium. Still, the work boots with alloy toe caps are lighter than steel-toed variants. This is because the alloy is at least 30 percent lighter than steel. Another difference is that the alloy variant has more space in the toe box. Both of them will set off metal detectors, but that’s a minor issue compared to safety hazards at work. This one makes use of a lot of material such as carbon fibre, fibreglass, plastic, and Kevlar. These materials aren’t metal, so rest assured that no metal detectors will go off with these toe caps. Having a non-metal material means that thermal conduction won’t happen. Thus, the toe box won’t be either too hot or too cold at any given time. Like alloy toe caps, they are 30 percent lighter than steel toe caps. Aside from toe caps, a work boot can provide even more protection by having metatarsal guards. Metatarsal refers to the five long bones located in the foot. Falling objects can damage these bones. With a metatarsal guard, both the toe area and the upper section of your feet get added protection. These guards come in steel, aluminium, and composite variants. Like the toe caps, manufacturers can use various materials to improve durability. Here, we’ll delve into why they use rubber, thermoplastic polyurethane (TPU), and ethyl vinyl acetate (EVA) for the soles. The bottom area of the boot refers to the outsole, which is usually made of rubber. The rubber material will help you in industrial workplaces. It will prevent you from slipping, and it is resistant to both oil and abrasion. This is why the construction boots use rubber outsoles. Still, the rubber quality will affect the performance of your work boots. Some proprietary rubbers actually offer better traction than others. Like the rubber material, TPU is a good choice for resisting oil and abrasion. It is chemical-resistant – a bonus for those working in chemical plants. While they are as reliable as rubber outsoles, a TPU outsole is lighter than them. Work boots tend to be heavy, so it’s not that easy to move around with them on. This is why manufacturers use EVA for the midsole area. After all, this is important for stability. As Reference.com states, EVA is lightweight and improves flexibility. The EVA material achieves this without sacrificing the impact-cushioning feature. This is why our collection of police boots should have an EVA midsole. Work boots offer protection using various materials. This is also made possible when manufacturers use their understanding of foot anatomy. On a related note, there are safety symbols that have that help people pick the right work boots. These symbols take note of these features to inform the individual fast. There are 11 symbols identified that you should take note of if you’re going to buy a new pair of work boots. You will find the correct work boots for your work when you learn what these refer to. As the name implies, this symbols means that the work boot can withstand chainsaws. Likewise, it can resist cuts and damages resulting from other cutting tools. Thus, woodcutters and loggers who want the logger boots look search for this safety symbol. The work boot uses a composite plate. This composite plate is lightweight. It can resist punctures without relying on metallic materials like alloy and steel. Like the previous safety symbol, this ensures that the work boots have composite toe caps. These toe caps are lightweight and tough at the same time. The Canadian Standards Assocation (CSA) has several safety symbols for work boots. They are now known as the CSA Group. This symbol means that the sole does not meet the standard for preventing punctures. Still, this blue rectangle means that it has a Grade 1 protective toe. This indicates that the toe section can protect you from an impact measuring 125 joules at most. There is only one difference between this and the CSA Blue Rectangle. This symbols means that the boots have sole puncture protection too. Here, sole puncture protections means that it can take on at least 270 pounds of pressure. People working in construction sites and machine shops will look for this. Aside from displaying a white rectangle, this CSA safety symbol also features Ω. This is a Greek letter known as omega. This symbol ensures that the work boot can endure 18,000 volts. Also, that the boot can withstand a leakage current measuring 1mA for 60 seconds at most. In other words, the work boots have electrical insulating properties. This characteristic makes it capable of protecting the wearer from electric shocks. This is a symbol important for people in industries prone to static discharge. This indicates that the outer soles can disperse any electrostatic charges. The CSA grants a pair of boots as static-dissipative if it can withstand 106 to 108 Ohms. This means that the work boots either have a steel toe cap or a metal toe cap. Both of these can provide enough impact absorption and compression. We discussed earlier that the metatarsal region of the foot needs adequate protection. This safety symbol means that the boots have a metatarsal guard. Thus, the boots can safeguard the middle section of one’s foot from falling heavy objects. This is the counterpart to the Composite Plate Protection symbol. The Steel Plate Protection symbol means that the sole can resist punctures. Finally, this yellow rectangle means that the boots offer more than puncture-resistant soles. This indicates that the work boots also have a Grade 2 protective toecap. In other words, the work boots have a super-static dissipative property. Now that you know what these symbols refer to, it won’t be such a hassle getting the appropriate work boots. Still, we can narrow down your choices even more. This time, we’ll identify the qualities you need to look for depending on one’s field of work. If you’re going to conduct paint jobs, you need a pair of work boots that can deal with all the slippery mess. Look for a lightweight model that has an oil-resistant, anti-slip outsole. Since you’ll be in an auto shop, the boots should have a Super Static Dissipative safety symbol. If not, it should have a certification that it meets the standard of the CSA or ASTM. These are important as you will be using machinery and power tools. You should wear lace-up boots that are between six to eight inches to get ample ankle support. This is important whether you are building a house or a piece of wooden furniture. Also, you should get the waterproof work boots. A slip-resistant and puncture-resistant outsole will help too. This will keep you safe when you’re conducting outdoor carpentry or woodworking. There is a good chance that you will climb a latter to go up the house. Thus, the outsole of your work boots should have a sturdy shank. This lessens the impact on the feet and calves whenever you take a step up the ladder. Also, a cushioned outsole will keep your feet comfortable while standing on concrete. To be safe, go for boots that have electrical shock resistance. This occupation requires workers to tackle constant demanding labor. You should be wearing lace-up boots with enough support for the ankles. This is important whether you’re on a highway or on top of a building. The outsole should be puncture-resistant. It must also have the approval of the CSA or the ASTM for electrical shock resistance. Furthermore, it’s best to use work boots with oil-tanned grain leather. This type of leather can resist hydraulic fluids that come out from lifts and excavators. People who will be working at docks need work boots that are waterproof. The outsoles of these working boots have to resist slips and punctures with ease. Like the first occupations, the boots must have adequate ankle support. It’s also beneficial for the worker if the boots have impact-cushioning properties. Your work boots need to have a certification from the ASTM or the CSA. A certification that the boots are resistant to electrical shocks is important. You will be handling a lot of wires and equipment, so look for relevant safety symbols. These include the CSA Yellow Rectangle and the CSA White Rectangle. Of course, you cannot forget the Super Static Dissipative symbol. As you’ve already expected, the work boots must provide ankle protection. Also, the leather should be waterproof and the outsole should resist punctures. Of course, those in the farming or ranching industry also need reliable work boots. Pull-on boots or lace-up work boots are always good choices. This is because they offer decent ankle support. Works will deal with rainfall and irrigation, so you must get waterproof boots. Moreover, the puncture-resistant outsole should have cleats for added traction on uneven terrain. These workers will be taking care of heating, ventilation, and air conditioning. They need waterproof work boots that have good cushioning. Also, there needs to be enough ankle support and puncture resistance. HVAC workers can wear flat-shaped outsoles to keep dirt away as they go from one house to another. The work boot requirements for landscapers are like that of a farmer or rancher. Their lace-up boots must be oil-tanned and have waterproof leather. After all, they will be in places containing fertilizers and other lawn care products. Also, a good heel counter is necessary to add stability when walking on muddy or uneven surfaces. To prevent oneself from ruining installations, the boots must have wedge outsoles. For masons and bricklayers alike, they are better off using lace-up boots to get ankle support. The outsoles must be well-cushioned because the workers are going to step on concrete for a long time. Also, A ideal work boots for masons should use oil-tanned leather to resist lime and calcium. For workers who are focused on conducting automobile maintenance, they should have slip-on or lace-up boots with anti-puncture, anti-slip, and cushioned rubber outsoles. Whether they’re exposed to water or petroleum products, one cannot risk losing traction while working. A pipefitter assembles and maintains sizable piping systems for industrial purposes. The lace-up boots must have waterproof leather. Since they will climb ladders at some point, their boots must have shanks for support. For some pipefitters, their boots must also have heat-resistant outsoles. A plumber needs the best work boot that is reliable even when the surface is wet with water or waste. As a standard choice, lace-up boots will help in protecting the ankles. Likewise, a cushioned and outsole will keep you comfy while standing on concrete. Search for the most comfortable boots when you can. Look for boots that have waterproof leather and outsoles with a shank to aid you in ascending a ladder. These workers will be installing building components and reinforcing concrete. The best boots for these people are lace-up boots with waterproof leather. A cushioned outsole will also keep them comfortable. Moreover, their boots will have puncture-resistant outsoles. A truck driver is often on the road to deliver goods. Such a worker needs lace-up or pull-on work boots with light leather. This will improve comfort and flexibility. Also, a cushioned outsole will handle impact absorption. A sturdy sole won’t succumb to abrasion resulting from asphalt and metallic surfaces. These characteristics can be found in the motorcycle boots too as they both require traveling on the road. A welder often has to handle various materials such as aluminum, steel, and brass. The work boots for welders should have a pull-on style. Also, they must be tough enough to guard you against sparks and slag. This awful slag comes out from smelting and ore refinements. Likewise, the leather should be oil-tanned while the outsole is resistant to puncturing. The soles should be flexible and resistant to heat. From these occupations, you saw that they all need durability and adequate protection. This applies both for general and specific work hazards. With the right pair of work boots, they won’t always have to worry. After all, work boots will guard them against slips and electrical shocks. Next up, let us look at the brands that make the best boots in the market. All these brands have a distinct selling point. Each has established a loyal following. Thus, it’s important to know about them to be an informed buyer. First, we have Caterpillar. Yes, they are popular for making construction equipment and other machines. But, you can also rely on their work boots for heavy labor. For transparency, it’s Wolverine that manufactures and advertises the Caterpillar work boots. Still, Wolverine knows that licensing the Caterpillar brand is a smart decision. Caterpillar boots are a common choice among people in Europe. Likewise, more and more people in the United States are paying attention to the brand’s style. You can get a well-designed pair of soft-toe or safety-toe work boots. Also, the Caterpillar work boots have sturdy leather boots and outsoles. Their insoles feel comfy and the contemporary style is a bonus. Caterpillar puts safety, durability, and comfort in focus to create work boots. Caterpillar boots are good for construction work. The same goes for other kinds of heavy-duty work. After all, Caterpillar knows a lot about machinery and its possible dangers. With this expertise, the brand has managed to become the best heavy labor work boots in the world. It has been more than 100 years since this beloved American brand began to make work boots. The most remarkable thing about Chippewa is its dedication to handcrafted products. Since 1901, Chippewa has been making tough boots. While the tradition of handcrafted boots has continued, Chippewa also added better features. These include superb cushioning and waterproof properties. Chippewa only uses high-quality materials for handcrafted logger boots. There is no other brand that can beat them when it comes to logger work boots. Like Chippewa, Danner has been in the industry for quite some time. Charles Danner founded the brand way back in 1932 in Chippewa, Wisconsin. For him, it was important to make boots with utmost quality regardless of their price. The brand only allows the highest form of craftsmanship. Firefighters, military officers, and police officers rely on Danner for tactical work boots. Triple stitching keeps the boots tough. The rough-out leather Danner uses is tough. Yet, it enables ample air circulation for breathability and comfort. The mesh lining helps improve the comfort too. Also, Danner work boots are durable and fire-resistant. The brand’s tactical work boots also have oil-resistant and slip-resistant properties. These characteristics will give you reliable traction. First of all, this is an American brand that is within the bigger Red Wing brand. The primary goal of the Irish Setter brand is to prevent your feet from feeling cold and wet. Irish Setter designs work boots that will protect you and keep your feet warm and dry. Since 1950, this American brand has been making the most impressive insulating boots. Aside from the insulation, the Irish Setter work boots are heat-resistant and slip-resistant. Instead of having ordinary leather, Irish Setter uses handcrafted leather. The S.B. Foot Tanning Company provides this to the brand. This Trout Brook leather comes from the best steer hides in the United States. While this brand isn’t as old as the others, it has made a mark in such a short amount of time. Formed in 1999, the Muck Boot brand has managed to capture the attention of workers. In particular, the brand is popular to those in need of the best waterproof boots. If your work involves stepping into water or mud, this is the brand you should be looking for. Muck Boot prides itself in making work boots that are 100 percent waterproof. The boots will protect your feet even in extremely cold and snowy environments. There are more than 60 styles to choose from. There are rubber boots and leather boots for people in farms, cities, and the outdoors. All Muck boots have outstanding waterproof quality. The brand is confident in its products that all Muck Boot products have a 30 -day return guarantee. The number one reason why people love Red Wing work boots is that of the leather. The material Red Wing uses is superb in quality. Once you use a pair of boots from these collections of Red Wing work boots, you will understand why the brand has loyal consumers. It doesn’t matter whether you will use safety-toe work boots or soft-toe work boots. All the work boots will feature waterproof and high-quality leather. Size is not a problem for this American brand that has been around since the 19th century. Red Wing makes leather work boots that vary in size for both men and women. Some of the boots feature very narrow widths while others are wide. Red Wing leather work boots are tough, comfortable, and stylish. This is probably the most popular brand in this list. Still, Timberland is known for good reason. The American brand knows how to make work boots that will please individual from all walks of life. 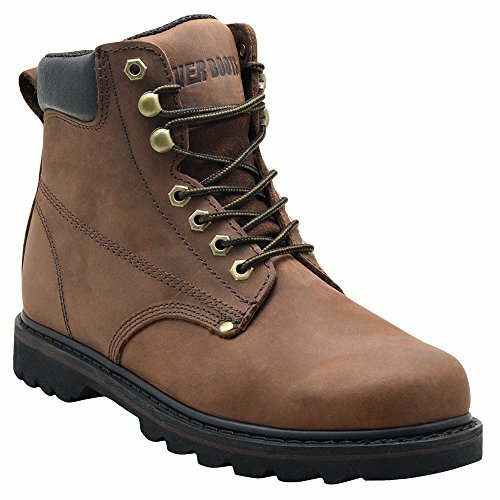 If you are going to do any laborious tasks, Timberland boots are reliable for those. If you are going for a walk in the city, go for the stylish and comfy models. Like Muck Boots, Timberland has a 30-day return guarantee. Moreover, Timberland has what it calls the Timberland Pro series. This line of all-around work boots offers a ton of nifty features. These include insulation, anti-fatigue properties, static dissipating technology, and quality safety toes. The final brand we have is Wolverine. This is a brand renowned for conducting extensive research about boots. Wolverine wants to develop technologies that will further improve its work boots. Thus, this is why it can make the best soft-toe work boots in the world. Like the brand’s safety-toe boots, its soft-toe work boots come in many styles. Some Wolverine boots use the rubber. Others have TPU material to suit the different working environments. Whatever the style, Wolverine’s soft-toe work boots will be resilient and reliable. We hope that you learned a lot from our comprehensive guide on work boots. We now know that people used work boots as early as the 18th century. Since then, they’ve only grown in importance with the onset of the industrial period. Today, work boots come in various designs. These boots suit different occupations ranging from landscaping to masonry. Moreover, manufacturers and organizations alike have improved the safety standards. With the right pair of work boots, you’ll be able to do your tasks without risking your safety. Thus, you should be well-informed and get the appropriate work boots. After all, work boots are worthy investments. They will keep you comfortable and safe in the years to come.